A short break in the city can be so appealing, especially at this time of year following on from the madness of the holiday season. Staying in a lavish hotel always has its appeal, but sometimes finding somewhere which can offer more of a home away from home feels more relaxing. Step forward the new FM Living Apartments* in Liverpool – situated in the stunning Grade II listed Produce Exchange Building, these stylish serviced apartments are a sophisticated blend of old and new. 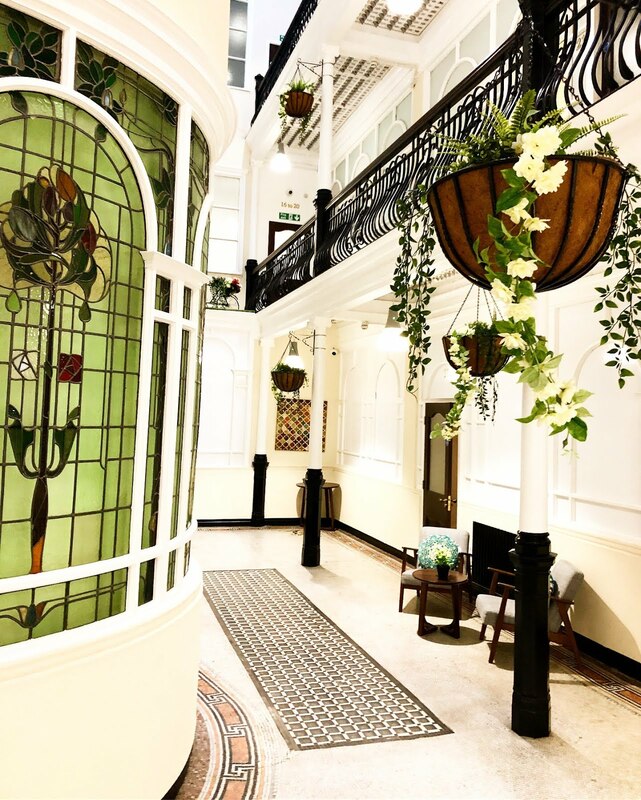 The reception area shows off the grandeur of a bygone era, with original stained glass and wrought iron features. It is easy to envisage the building’s former purpose as the Produce Exchange, where the administration of goods imported to Liverpool took place. Later, the building became a bank – but I must admit that it really suits its new use as a serviced apartment space. I was greeted by the lovely FM Living General Manager Ricky and after a good catch up (we have known each other for a few years!) he whisked me up to show me the apartment which would be my home for the night. 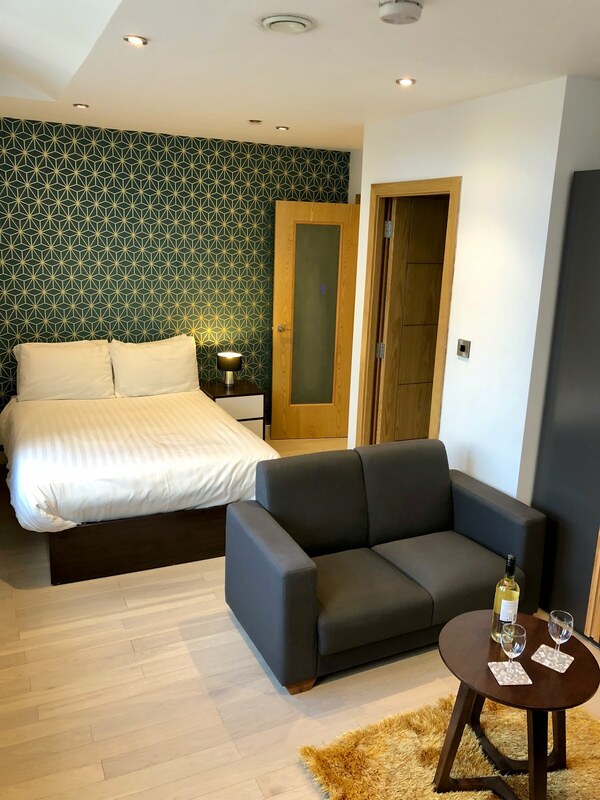 The first thing which struck me was how bright and airy the space was and all the creature comforts of a hotel were in situ – including a welcome bottle of chilled Chenin Blanc! 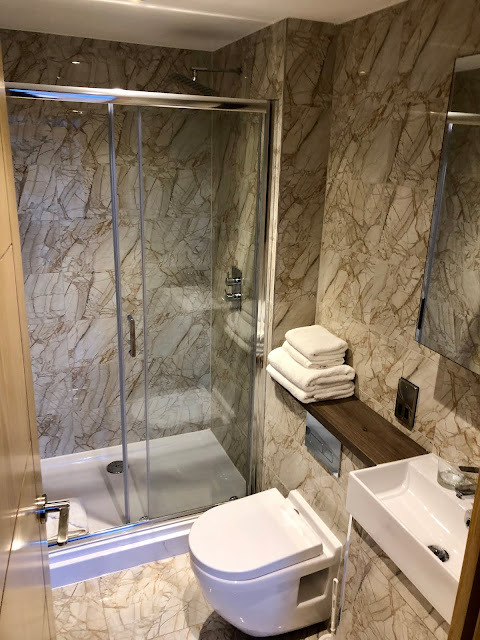 The apartment also featured a sleek marble bathroom with waterfall shower and mini bath products. 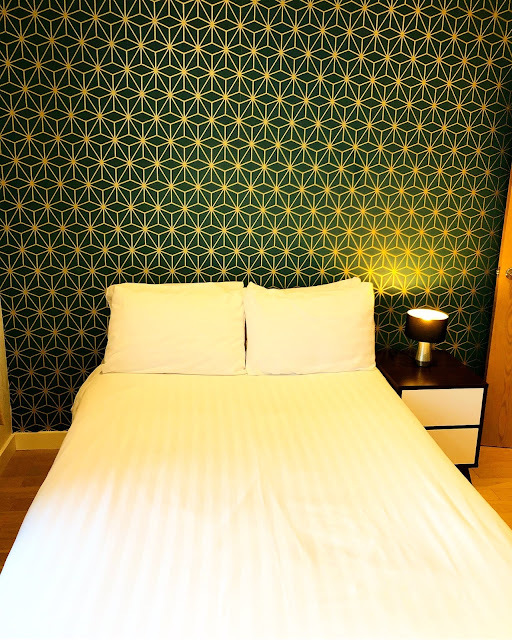 The neutral décor of the space was given a splash of colour by a feature wall of striking gold and green wallpaper and the comfortable bed was bedecked by crisp white bedding. 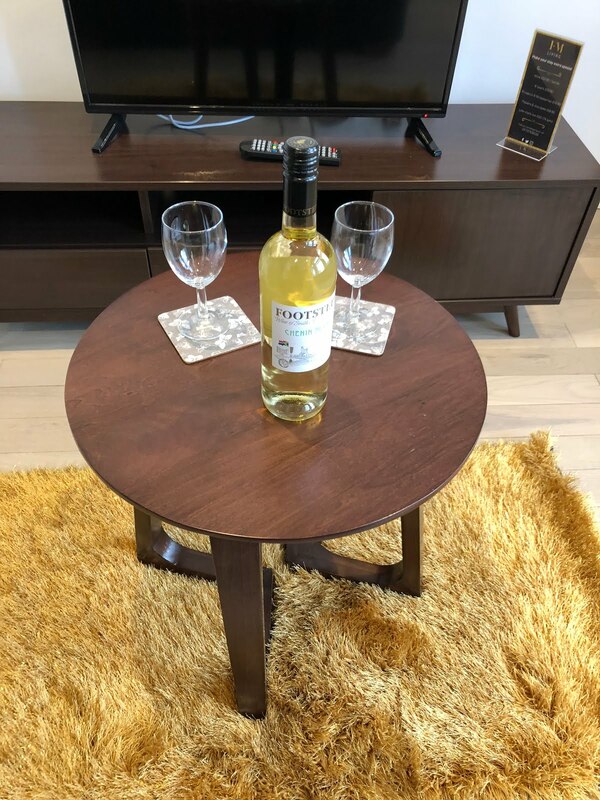 Add to the equation the fully equipped kitchen and comfortable lounge area with television and coffee table and I was one happy guest anticipating a night in the city. 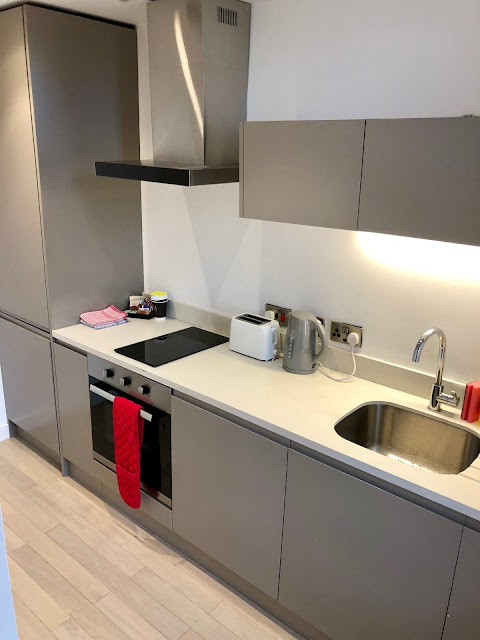 It really is a bonus to have your own kitchen during a break like this and I was pleasantly surprised to see the kitchen was filled with every appliance (hob, fridge, toaster, kettle and even a washing machine!) and utensil you could possibly need. 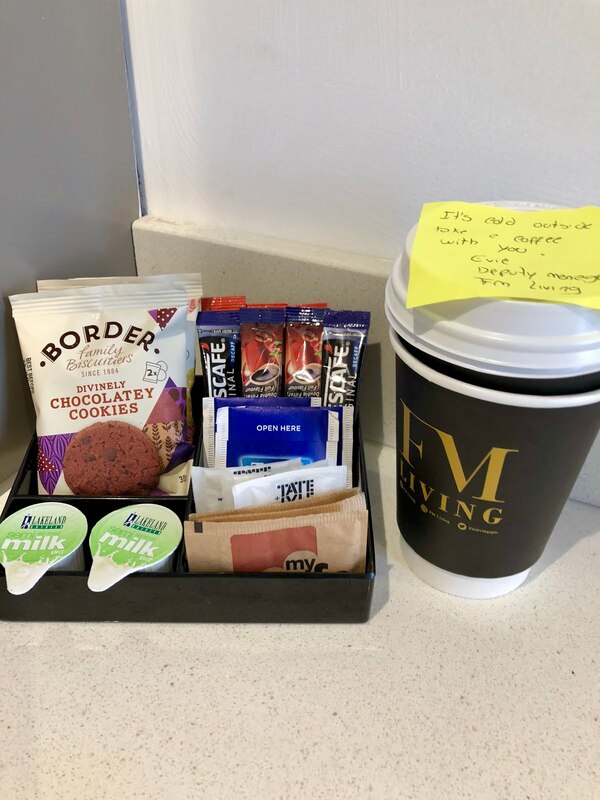 The addition of a hospitality tray with tea, coffee, biscuits and even take away cups was another thoughtful touch. 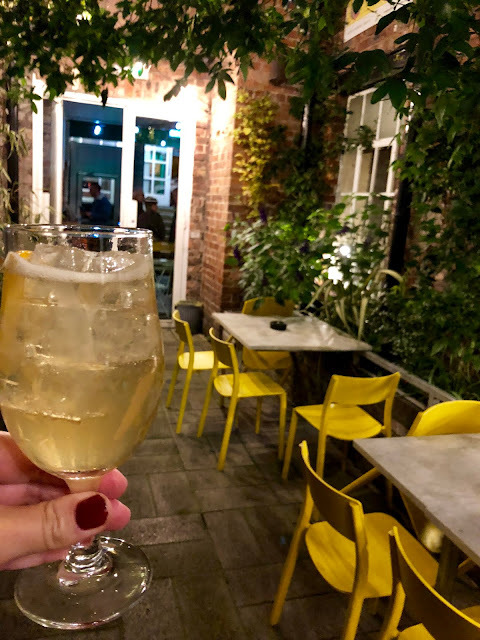 After a quick shower and a trip to the shops for some snacks to accompany my wine, I had a glass of wine before heading out to some of my favourite Liverpool bars. The nightlife in the city is second to none and when you stay at the FM Living apartments, the bars and restaurants of Castle Street are only a two-minute walk away. Later, after indulging in the buzz of the city I headed back to my temporary home with a take away and watched a movie before I fell in to a restful sleep. There really is something about staying in a place like this which feels much more restful than a hotel and the next morning, I had a leisurely cup of coffee before I checked out and bid my apartment a fond farewell. If you are looking for a perfect base to stay in Liverpool city centre, the FM Living Apartments are the ideal choice! What do you all think, do you prefer to stay in a hotel or an apartment when you go on a city break? As always, I cannot wait to hear your thoughts and thank you so much for reading this post! 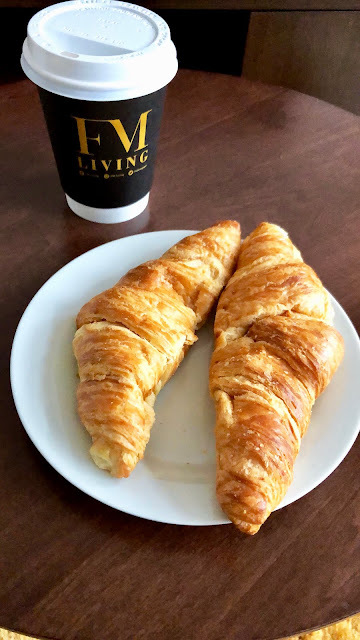 *I was invited to stay as a guest of FM Living Apartments, my stay was complimentary. All opinions expressed herein are my own and honest. Port is one of those drinks which you may already have an opinion on, it is not for everyone and perhaps the image of Port isn’t exactly what could be described as fashionable in the same way that Gin is regarded. I was intrigued then, when I was kindly invited to an evening with Martins De Sá Port at Pen Factory in Liverpool recently. Situated in the elegant Georgian Quarter of Liverpool, Pen Factory as the name would suggest, is located in a former pen factory. Downstairs a convivial bar and open plan restaurant is flanked by a pretty courtyard which leads to an events space upstairs. The invitation promised ‘let us change your opinion on port’ and I was all set for this as we gathered in the charming space, where we were warmly welcomed by Marco the founder of the brand. The concept behind Martins de Sá Port is to introduce port to a new audience and their port is younger, so not aged for such long periods and often lighter in taste - the ports are bottled in sunny Portugal and this shows in the flavour. The event space was candlelit and our places set, ready for us to enjoy a specially created tasting menu paired with port. The Pen Factory now serve Martins de Sá white port and tonic on draft, which is such a novel idea. This aromatic port is full of white grape and it was a refreshing welcome drink to get the evening underway. White port and tonic is so crisp and easy to drink and it makes a welcome change from gin and tonic. 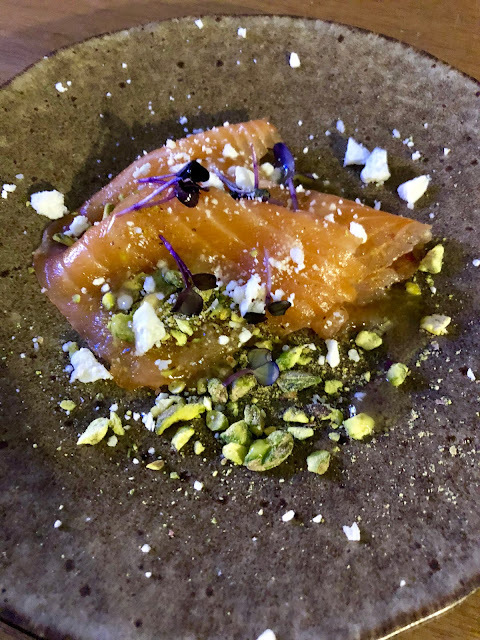 The first course of cured salmon with grapefruit, pistachio, orange blossom and goats curd was a light and flavoursome starter and the salmon paired perfectly with the Martins de Sá white port. Tawny port paired with smoked duck breast apricot, chanterelles, sourdough and boffard curado cheese was the next course which again highlighted that port can be just as versatile as wine when it is served with food. The tawny port offset the rich duck breast perfectly; this port is aged in the classic tawny style using casks, and it has smooth and sweet notes. 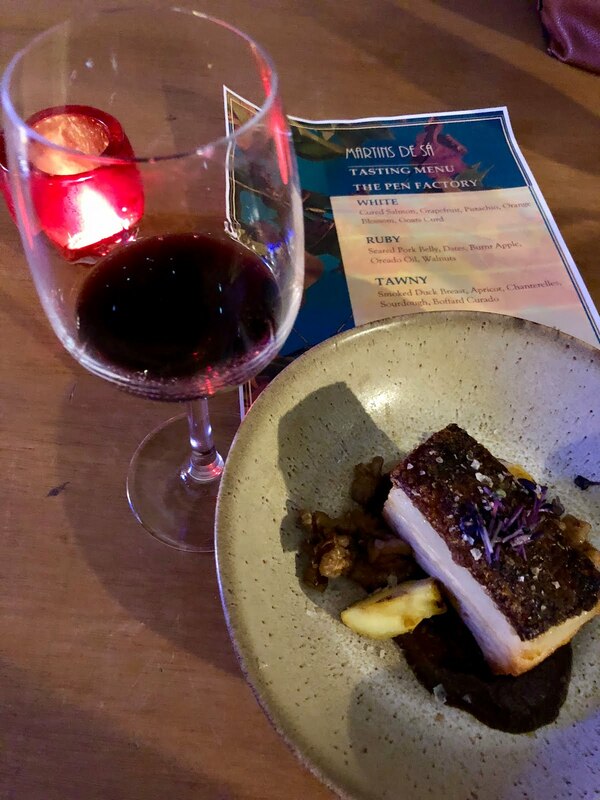 Next up was the fragrant Ruby port, paired with seared pork belly served with dates, burnt apple, Oreado oil and walnuts. 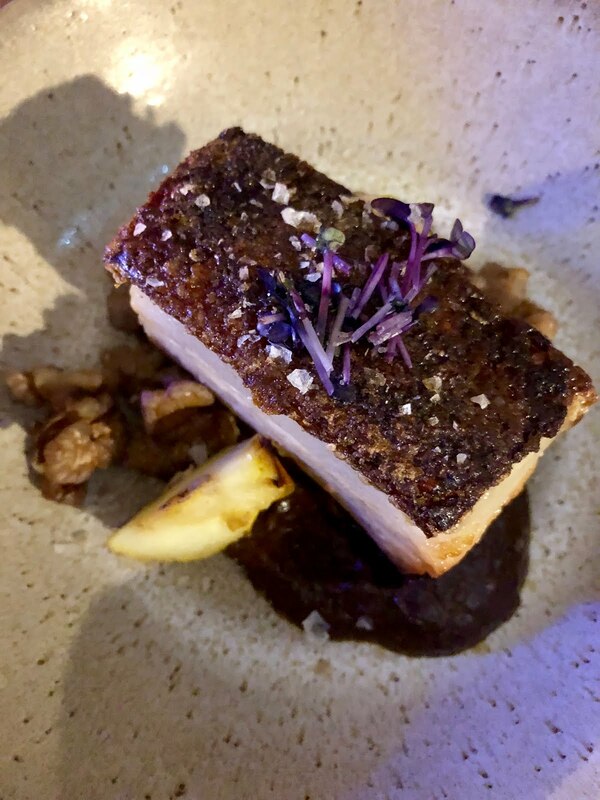 The succulent pork was a delight with the sweet dates and zesty apple and the Ruby port really complemented the subtle layers of flavour - this fruity port is aged without exposure to oxygen. One of my favourite ports we sampled was the Rose port, light and sweet this was a delicate delight and ideally suited to a novice port drinker like me! 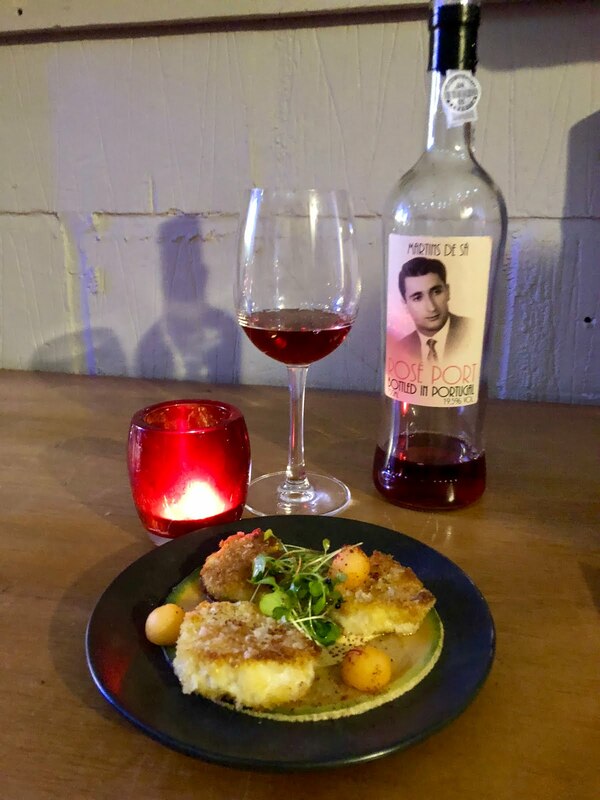 The notes include cherry and honeysuckle and this port was paired with cod loin fritters, sour melon, rocket, paprika and saffron, just the Mediterranean style dish to go with the rose port. We rounded off dinner with traditional Portuguese Pastéis de Nata and stewed pear with white port and rhubarb ice cream. It was a pleasure to attend the dinner which was a fascinating odyssey through the different styles of port produced by Martins de Sá. Marco proved to be an incredibly knowledgeable and friendly host and it was an evening of great food and good conversation which we all thoroughly enjoyed. Thank you again to the team at Martins De Sá Port for welcoming me to dinner at Pen Factory and you definitely changed my opinion of Port! 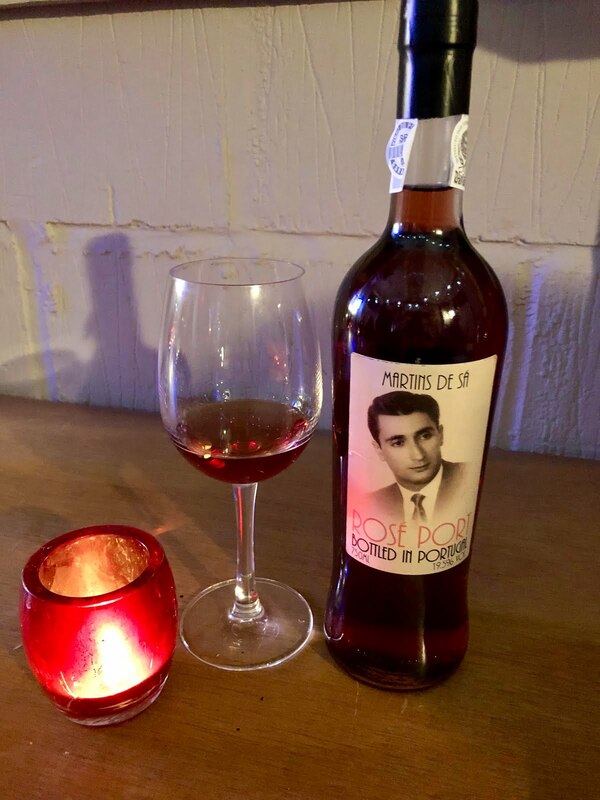 What do you all think, do you like drinking Port and what kind have you tried? As always I cannot wait to hear your thoughts and thank you so much for reading this post. It has been a while since I have had chance to post anything here, I have been working so hard on the writing side of my career recently and things have been busy. 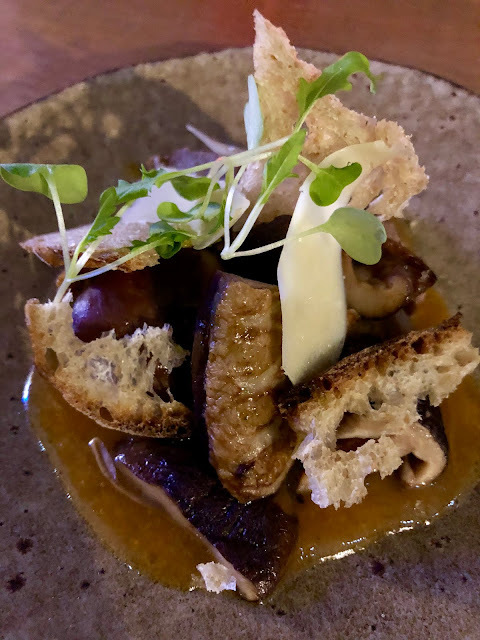 When I am away from home more often, it is grounding to get the chance to go out in my own area and last week I went along to sample the new menu at The Devon Doorway* in Heswall, a short way from where I live. I have long been a fan of this elegant gastro pub, which has recently been given a stylish new look. Rich jewel tones, crackling log fires and soft lighting set an intimate scene and upon arrival, we headed to the Tanqueray bar, where various gin and tonic combinations were available to customise with extra botanicals. We settled in the bar area to enjoy our welcome drinks and canapés. There is an impressive drinks offering on the new menu, with cocktails, wine, G&T, craft beers and aperitivo drinks such as Le Goose Fizz with elderflower and Grey Goose vodka available. A board of artisan breads and plump Nocellara olives got the meal underway, while we consulted the menu. 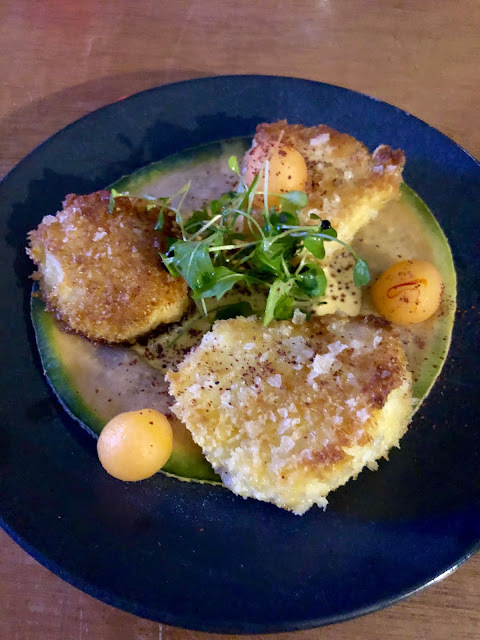 A fragrant onion soup was my choice of starter; ideal for an autumnal evening this was satisfying with a wedge of crusty bread and my dining companion quickly devoured his choice of deep-fried brie in golden panko breadcrumbs, served with tangy chutney. I was impressed by the vegan menu, which consists of several options and I decided on the spiced coconut curry for my main. Although I am not vegan, I love to eat vegan and vegetarian dishes regularly and this curry was so aromatic and tasty. The sticky jasmine rice had the perfect texture and the curry pulled off the tricky balance of sweet and spicy flavours, with Ras el Hanout roasted squash cubes and sweet potato wedges adding further depth and a scorched red chilli providing a fiery finishing touch. My dining companion went for a simple but classic choice of battered halloumi with twice cooked chunky chips, minted pea purée and tartare sauce.This makes a tempting alternative to traditional fish & chips and is great if you are in the mood for comfort food. 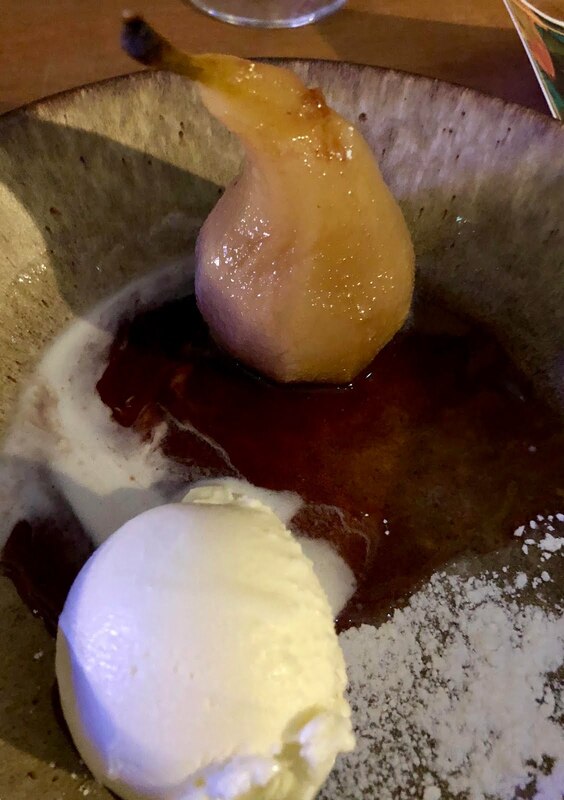 A dessert which tastes as good as it looks is always appealing and the melting chocolate and peanut bomb did not disappoint in this regard, with the chocolate sphere melting away under salted caramel sauce, to reveal a sticky toffee pudding and peanut butter cream centre. Bourbon vanilla ice cream and edible flowers rounded off this indulgent creation. Our second dessert of chocolate and raspberry pudding was another winner - a light chocolate sponge filled with a raspberry compote centre, accompanied by Bourbon vanilla ice cream. Both desserts were nicely presented and they made the perfect way to round off an enjoyable meal. I was impressed by the new menus at The Devon Dooway, which are well thought out with a good range of dishes available. The new look gives the pub a sophisticated atmosphere which is usually more synonymous with city centre bars and the team could not be more helpful. Overall, this is the ideal place to relax on those autumn and winter evenings. What do you all think, do you like the sound of this refined pub and dining venue and which of these dishes would you like to try? As always I cannot wait to hear your thoughts and thank you so much for reading this post. *I was a guest of the Devon Doorway, this meal was complimentary. All opinions expressed herein are my own and honest. 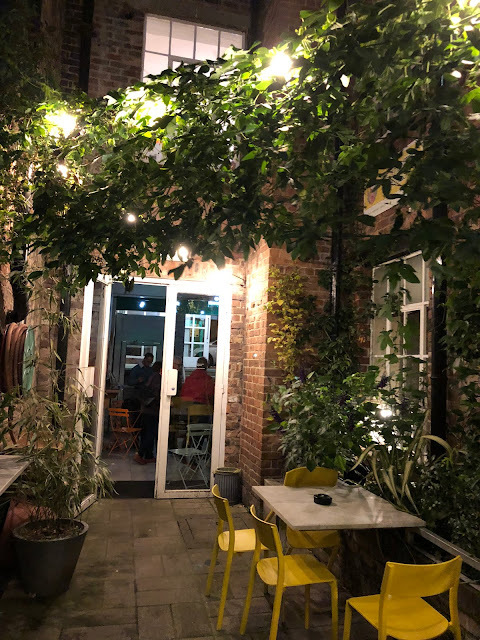 It is good news when a slightly outlying area of a city is populated with great restaurants and this is true of Liverpool’s Smithdown Road which is home to several enticing eateries and cool bars, just outside the city centre. I love this area of the city for its vibrant and cosmopolitan atmosphere and Maggie Fu has been on my list of restaurants to try for a while, so it was high time when I finally went for dinner there recently. The menus offer a pleasing mix of Chinese and Japanese inspired dishes such as ramen, katsu curry and stir fried creations. We were warmly welcomed and seated straight away despite not having booked a table. Over a glass of wine for me and a Fanta for my designated driver, we perused the menu where the big bowl stir fried dishes caught my eye, before I settled on a sweet potato katsu curry for my main. The restaurant was bustling with customers when we arrived, which was a promising sign on a weekday evening. I like the fun and bouncy energy of the space, which features an open-plan dining area flanked by an open kitchen and walls adorned with vibrant graphic art. There are plenty of starters to choose from, so we ordered a selection to share. Spring rolls are a classic I can rarely resist and the crispy filo and generous amount of filling made these a winner. Vegetable gyoza had a vibrant green colour and a delicate flavour and a steamed bun filled with tender roast chicken was an authentic treat paired with teriyaki sauce. I would recommend ordering a selection of appetisers, as there are plenty of inviting options to try and it is enjoyable to start a meal with a variety of flavours. We moved on to mains and my partner went for the three-meat ramen with curry broth, topped with wantons and chicken balls. This steaming bowl of ramen was heaped with succulent meat and the aromatic curry broth had a subtly spicy taste while crisp green vegetables, wantons and chicken balls added to the overall flavour. The ‘build your own ramen bowl’ section of the menu is genius, because you can customise your bowl choosing which noodles, broth and toppings you prefer. Be warned, the portion size means you need a healthy appetite to do justice to one of these! My sweet potato katsu was everything a katsu curry should be – comforting and hearty, the sweet potato in golden panko crumb was enrobed in plenty of thick curry sauce, which initially tasted mild then rounded off with a pleasant kick of spice. The sticky rice was the stuff rice lover’s dreams are made of and this katsu more than delivered the goods, omitting the meat without missing out any flavour. We added a side of salt and pepper chips to our order and the fries garnished with spices, onion, pepper and chilli were the perfect addition to the meal. Excellent food, friendly service and reasonable prices are just some of the reasons to stop here for a bite to eat and it is always gratifying to see an independent place like this full of genuinely happy customers. Do you like the sound of Maggie Fu and which of these dishes would you try? As always I cannot wait to hear your thoughts and thank you so much for reading this post. Some restaurants hold such good memories, that walking in to them is like greeting an old friend. This sums up how I feel about Gusto* Albert Dock, where I have dined for many years and the waterside location makes this such an attractive place to eat. Inside, the stylish interior includes dark wood, mirrored wall details and twinkling fairy lights which create a timeless charm. The food at Gusto is Italian inspired and you will find a range of pizza, pasta and salads on the menu alongside seafood and steaks. We went along to check out the new Gusto summer menu recently and after settling at a table by the window we sipped chilled Pinot Grigio and started the meal with cheese and truffle crispy ravioli while we pondered what to order. 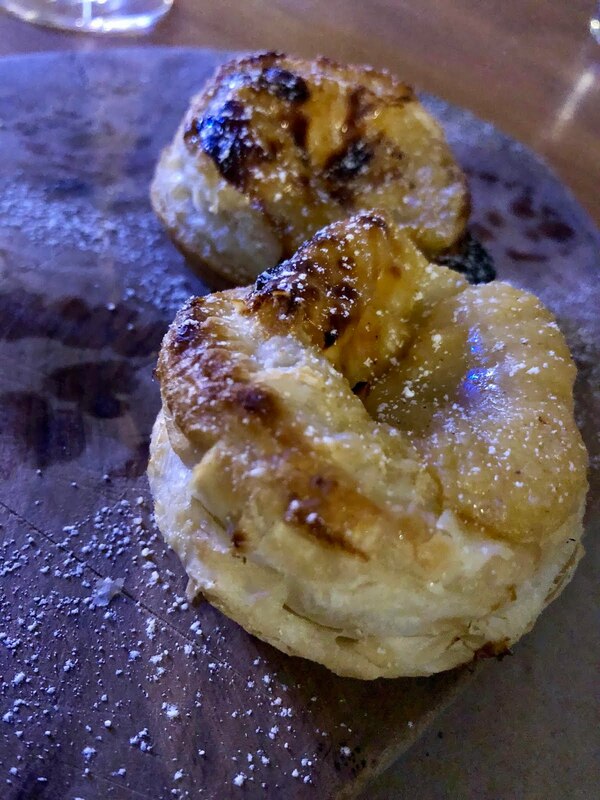 I was introduced to the joys of fried ravioli and tortellini during a press trip to Verona and these were as good as any I tried in Italy, stuffed with Stracchino cheese and laced with truffle oil and romesco sauce - the flavours were simple and delicious. No visit to Gusto is complete without an order of garlic bread and the garlic pizza bread with rosemary and sea salt never disappoints. We moved on to starters and my dining companion's choice of Milanese style meatballs was a hearty dish with a real depth of flavour to the hand rolled meatballs, dusted with Gran Moravia cheese and served in a tangy lightly spiced tomato sauce. My choice of king prawns, pan fried with pickled fennel, tomato, caper and chilli oil packed in a wealth of flavours – the prawns were cooked to retain their succulence while the chilli oil added a pleasant kick of spice. I was impressed to see some vegan dishes joining the menu, including the Vegano pizza (tomato base, courgette, pine nuts, caramelised onion, roast peppers, cauliflower rice, and rocket) and my eye was immediately drawn to the spaghetti verdi, which is also available as a vegan option. The generous portion of spaghetti had a vibrant green colour thanks to soya beans, French beans and pea shoots and the wealth of bold summery flavours made this a perfect choice of main course for a sunny evening. Sides of polenta chips and Italian fried courgettes completed the feast – these are a good choice of sides to share as the polenta chips are chunky and indulgent while the courgette fries are a slightly healthier spin on French fries. The pizzas at Gusto are not to be missed - thin and crispy, the dough is made from scratch in-house daily. My dining companion enjoyed the Pepperoni salsiccia, heaped with pepperoni and mozzarella which is available with extra chilli if you are feeling brave. On to dessert and the evening was a little to warm for my usual favourite Gusto pud – the Nutella calzone which is freshly baked to order. Instead I rounded off the meal with a warm chocolate and hazelnut brownie with salted caramel ice cream and dark chocolate sauce. My dining companion meanwhile went for the homemade Gusto Tiramisu served in a towering slab, with smooth layers of creamy mascarpone and just enough of a boozy undertone. Dining at Gusto always leaves me feeling contented and the combination of impressive food, service and stylish surroundings makes it a consistently reliable dining destination in Liverpool. The new menu has some interesting additions which are definitely worth checking out. What do you all think, do you like the sound of Gusto and which of these dishes would you try? As always I cannot wait to hear your thoughts and thank you so much for reading this post. *I was invited to try the new menu by Gusto, this meal was complimentary. All opinions expressed herein are my own and honest. Over the past few years, Castle Street in Liverpool has become one of the most thriving areas of the city when it comes to dining destinations. A wide choice of restaurants and bars jostle for space along this elegant street, in the shadow of the stately grandeur of the Town Hall. Heritage* has been on my radar for a while, I have heard glowing reports about this independent restaurant since it opened in February and more recently I have walked past a few times and seen people contently sipping cocktails outside in the afternoon sun and I kept meaning to drop in for one myself. Last week it was high time that I finally dined at Heritage and after a quick pre-dinner drink nearby, I was ready for food! A quirky space awaits when you step over the threshold of Heritage, where shelves lined with succulents, a compact bar area and patterned tiles create a vibe which is cool without trying too hard. We were immediately served a carafe of chilled water - a touch I appreciate so much and wish that more restaurants would adopt. A round of Capri cheesecake cocktails got proceedings underway in style as we pored over the menu – this refreshing blend of vodka, limoncello and pineapple was just the ticket for a sunny day. A selection of 2-3 small plates each was recommended and we obliged by ordering a wide spectrum of the varied menu. Dishes here are uncomplicated and the flavours do the talking, a simple culinary philosophy which is underpinned by quality local and seasonal ingredients. As the name suggests, the fusion of styles on the menu stems from the diverse heritage of the owners - Heritage is the brainchild of Alex (a chef of more than 20 years), Antonia, Lauren and Adam who teamed up to create a restaurant which reflects their backgrounds. 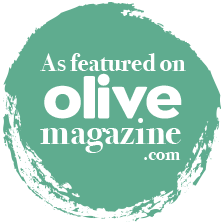 The result is a menu peppered with Middle Eastern and European influences, as well as updated versions of classics (think Yorkshire rump steak served with tangy beer onions and gravy). We dived in to the meal with ‘our bread, hummus & punchy zhoug’ a sweet burst of pomegranate seeds adorned the hummus which paired well with crusty homemade bread, while the zhoug packed a moreish punch with a carefully balanced blend of spices. An elevated take on traditional fish & chips, seabass with skinny fries was another winner and the buttery fish paired well with chunky house made tartare sauce and crunchy fries. Our next arrival - slow cooked Indian spiced beans n’ peas and Alex’s chicken curry delivered layers of flavour worthy of many renowned Indian street food restaurants - the slow cooked spiced beans and peas were satisfyingly hearty thanks to the combination of ingredients. Give me a bowl of this any day and I will be happy! My dining companion tucked in to Alex’s chicken curry, tender chicken pieces in a velvety curry sauce which had a mild yet subtly spicy flavour. Both dishes were topped with pillowy homemade naan bread, which we tore in to without preamble! Next up, ‘bag of brine n’ fried chicken’ a paper bag of golden fried chicken (soaked in brine first before it is fried, to retain its tenderness) was a delight with house made sweet chilli and barbecue sauces. A bowl of falafel with fresh tahini yoghurt and a zesty cucumber salad proved refreshing and tasty. There was just enough room left for a creamy bowl of coconut rice pudding, raspberries & passionfruit which ended the feast on a tropical note, with the kind of dessert just made for eating on the terrace of a villa in Bali. We relaxed with a coffee before departing in to the evening, happily replete after our meal. Heritage is an intriguing restaurant and bar which proves more than worthy of its name, with a menu showcasing a range of global influences which translates to delicious food. It is pleasing to see another independent holding its own in this competitive area of the city and they work with some great local suppliers including Crosby Coffee and Dead Crafty Beer Co. All in all, dropping in here for some (not so small!) plates and drinks is a perfect way to while away a few hours and you can choose three small plates for £15 at lunchtime. What do you all think, do you like the sound of Heritage and which of these dishes would you try? As always I cannot wait to hear your thoughts and thank you so much for reading this post. * I was a guest of Heritage to sample their menu, this meal was complimentary. All opinions expressed herein are my own and honest. I'm a fashion, food, beauty and lifestyle blogger. I love styling clothes and reviewing places and products! All content on this blog is copyright Camille Allcroft and may not be reproduced or otherwise used without my consent. Thank you for taking the time to comment and/or follow! It really means the world to me and I read every comment. I would be delighted to check out all of your blogs too if you leave a link in your comment!